I currently run 4 AF Legacy Engines which are listed as Dcc capable by Lionel. I decided to try to test them on a dcc test track and decide if it is worth the effort to add dcc to my layout. The four are: 2 Alco PAs, 1 sd70 and 1 es44. I have a Lenz 100 set Dcc Power cube and LH100 hand held controller which I previously used for 5 SHS engines with no problems! Neither of the Alcos show any response when powered up on the Dcc track! The es44 powers up and responds to address and several functions but will not respond to any movement commands... The SD70 responds to movements and some functions. I would appreciate any comments on the preformance and/or experiences anyone has had using Lionel/Flyer Engines. I see the new Legacy Berks are also listed as DCC capable, so Lionel seems committed to DCC. Thank you for your attention. retired ATSF/BNSF. Love S Guage! The one thing that was learned during the dcc development was all dcc systems are not created equal. I don't recall if Lionel tested with a Lenz system . I recall several different issues occurred with the MRC, Digitrax, and NCE systems that had to be resolved. Unfortunately, I'm not familiar with the Lenz controller to offer any suggestions. My shs engines run great on dcc. my y3 wont do dcc needs program change and same problem with my pa the es44ac runs good on dcc have a lionel 1990s pa i converted to dcc it run fairly well hope to finish a Gilbert Hudson in the next few days i use a digitrax zphyer . been using the 465 4 amp on my conversions. It's important to note that the SD70s were the first Flyer locomotive released with dcc code. Other Lagacy Flyer locomotives released before and including 2012 did not have dcc code. Part of your description makes it sound like the dcc booster isnt powerful enough. The system you describe is a 5 amp system. It could be the booster is cutting power due to a sensed overload. When I tried my MTH dcc out on an NEC 5 amp system, it did the same thing. Occasionally it would start up, but any movement commands sent the NEC booster into overload mode. Sometimes the engine wouldnt respond at all. Once my NEC10 amp system arrived, everything worked perfectly. I have both a Roco Z21 (3 amp) and an NCE powercab (2 amp). Both run the SD70s and ES44s just fine even in consists. I do notice that the SD70s lose the DCC address after being used with Legacy. The ES44s always work. Send a 08 to CV 08 to reset it and see if that helps. Did you program the loco with the Program/Run switch set to "Run"? I tried this on mine and I was able to change the address and such. Try disabling Railcom. Guys, could the problem be that he is using an "older AF AC power pack"? Or does the Lenz power cube make the conversion to the square-wave AC required by DCC to embed the digital signal? Periodically I run mine on our club's Digitrax layout and usually get them to run pretty well. DCC capable is a relative term. My observations are that the latter such production the better, but still without a true NMRA DCC decoder inside (which they don't, but your DCC SHS engines do) you won't get as good a DCC experience as you can/could/would with a decoder, especially in terms of features, functionality, programming, and cross-system compatibility. Not to say with DCC-c engines you can't have some fun, just don't expect as complete or "pure" an experience. DDC-c engines, however, do seem to be improving as we go. PS DCC system output to your rails is neither DC or AC voltage. Said meters do not give you an accurate reading. It is DCC. You need a meter that can read DCC. Power (amps) for torque or strength and potential (volts) for speed work hand-in-glove, so be sure your DCC system has enough of both. DCC starter sets are often designed to provide enough for n and HO scale. You may need to 3A or 5A boost one for dependable S running. I prefer 18V over 15V. DCC transmits signal through wheels in contact with rails (not through the air as with TMCC and Legacy) so be extra certain both are very clean and that you're getting consistent power delivery around your layout. 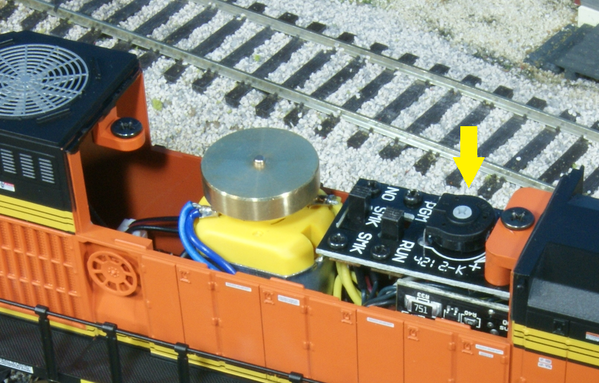 Use a DCC meter under load (~1.5A with a light bulb) to measure DCC voltage to the rails as you drag it along your tracks. Address breaks and/or drops in power. Enjoy! Amps are important but amps and voltage work together. In simple terms, voltage is speed and amps are power. Any major DCC system you can buy today will have enough power to move at least one S scale locomotive. The Lenz 100 is a 5 amp system aimed at S and O scales. 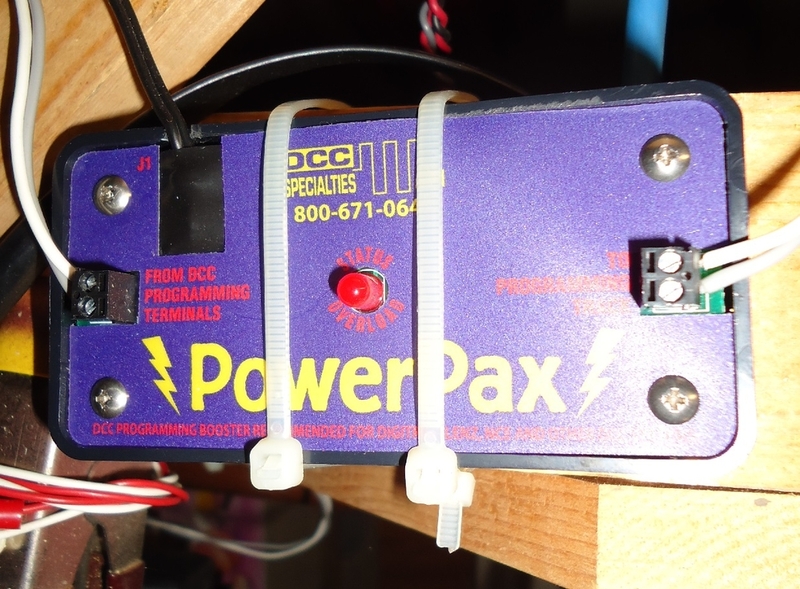 Use a DCC meter under load (~1.5A with a light bulb) to measure DCC voltage to the rails as you drag it along your tracks. Good idea. While it is true that a standard meter doesn't report the actual DCC voltage, the reading given is still useful for comparisons around the layout. Good points Brendan. I edited my post. Thanks. Guys, I really appreciate all the replies and comment to this topic.. My original goal was to decide if adding DCC to my layout is worth the effort, I wanted to be able to run my SHS DCC engines with my Lionel/Flyer engines and DCC seemed the common factor. As noted earlier that is not as easy as I thought it would be. Here is where I am with your help. As suggested I removed the small old flyer transformer I had connected to the DCC test track and connected the STRAX DC 5400 transformer I got from Doug at Showcase, it ran all my SHS DCC engines fine using the Lenz DCC Set 100, which is also connected to the test track, one big problem with Lenz for some reason the Lionel Flyers get an 01 error on(no response) the program track, so I can Not read or write on it. I can use PoM and I was able to change the address of the SD70 and ES44 using the Program/run modes on them. The two DCC capable(?) ALCO do not respond at all in fact I accidently found out they respond to transformer control. One nearly leapt off the table when I accidently cycled the power at full throttle. I also tested the SHS DCC small SW9 to be sure this set-up was working and it is. The SD70 seems to be responding as well as possible considering it's DCC limitations. The functions seem to be working and it responds to movement commands, although I don't understand its forward/neutral/reverse sequence. It seems some of the time one touch will reverse it other times I have to try it several times(nearly ran it off the table too). If someone could explain or comment on that I would appreciate it.. The ES44 is the real mystery, I was able to get it to respond to the Short Address and it powers up fine, engine sounds, Bell, Whistle, lights etc. It's direction lights even change when I get it to reverse but will NOT move, it is like it needs to release the brakes or react to the RUN button as on the Legacy Command module. I have changed CV8=8 to reset and then set back to 73. I have set CV2=2, CV3=15 and CV4=15, still no response(also set the same on the SD70, it moves...). Are there any other CVs that might be holding it back..? All four units still run fine in Legacy mode on the layout. So at least I haven't messed that up. Again, I would very much appreciate any replies, comments, suggestions on your parts and as I said earlier I am most Thankful for your help. Doug - Good luck on the Hudson conversion! A nicely detailed Legacy Hudson would certainly finds its way on to my modest layout. I actually saw the 'Blue Goose' pulling a small passenger train through Dodge City Ks with My GrandDad when I was a very little guy... There is a Santa Fe Hudson on static display in Topeka, Ks if you are ever there(it is in shameful shape though).. Thanks again Guys, really appreciate all of your comments. A learning experience! I would reduce CV 3&4 to 0 or 1 for testing. Sometimes the momentum is so slow it seems like it is not going to move. What value is in CV 29? When you set CV 8 to 8, remove power; do not set it - it will reset itself. What value is in CV29? Fwd N Rev... Why? To park, headlight on, smoke working, whistle before movement, or for an operating car to get power for it's action without the loco running off. To be accurate, it is some form of AC or DC (pulsed). No way around it. 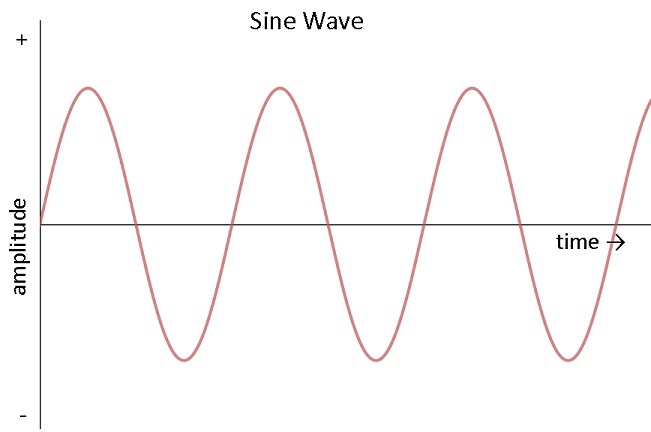 A serial data transmission who's signal is based on the frequency of a change in signal is more accurate. It piggy backs the motor power or via. Radio waves. Lionel puts DCC in S Legacy locomotives? I wish they did that for O too. But as to the locomotive that isn't moving, I would also make sure the momentum is off. I recently converted an O locomotive to DCC (With LokSound L) and it seemed to ignore my throttle too (NCE 10A). Once I reprogrammed the ID it seemed to respond better, and then once I turned momentum off it really was responsive. Correct. The DCC signal is AC. Its not a pretty and stable sine wave that one sees coming out of the wall receptacle, but it is absolutely AC. But as to the locomotive that isn't moving, I would also make sure the momentum is off. That's the CVs 3&4 that I mentioned he should change to 0 or 1. He currently has them set to 15. Thanks for posting. I should really stop going by memory. Thanks Brendan, Sinclair and Rusty! As you have suggested I have set CVs 3 & 4 to 0, with no change it the results... Brendan also requested a reading of CV29, my program track is incompatible with Lionels DCC, it gets a ‘01 error’ so I can’t read or write on the Program track( tried it with the ‘program/run’ switch in both positions), I can use PoM. I would assume CV29 would remain its original values as I have not made any changes there. Does anyone know of Any differences between the SD70 and the ES44 programming? The Sd70 moves and the ES 44 does Not... Also please explain the use of F10 ‘Sequence Control Trigger(only while stopped)! The use of the <> key seems inconsistant on both engines(the ES44 directional lights will sometimes change with the use of <> even though it does not move). Again, my continued Thanks to everyone for sharing your time, thoughts and comments..
As far as I'm aware, except for a little tweaking for conventional DC operation, the SD70 and ES44 code is the same. Electric Railroad Company did the DCC development for Lionel back in 2012, but Lionel ended their contract and they have also now exited the business. Looking back, using the programming track for Lionel/Flyer was erratic, while PoM was fine. One thing I had to do with my MRC system (even with the 10 amp power supply) was purchase a booster for the programming track. This one is from DCC Specialties purchased from Tony's Train Exchange. My NCE powercab can program it in run mode. If I use program mode, the horn beeps when I program but the value doesn't seem to stick. I am able to consist two locos. I generally use Legacy because my switches are switchable from Legacy. If your sound and reversing works, there could be something wrong with the decoder - a blown diode killed my MTH. I was able to replace it. Brendan - I have given that some thought too, but since it responds to functions I am discounting it for now... I am thinking of trying to set up a double-header with the Sd70 and Es44 just for kicks and see if the Es44 responds! Does it make any difference when programming Lionel AF DCC capable engines whether your smoke slide-switch is in the OFF position? I haven't experimented with that to see, but know from converting Gilbert engines with smoke units to DCC that you have to provide a way to hardwire interrupt connection to the smoke unit or the decoder will see it as a short and not program (process CV changes) the way it ought to. I don't know if the smoke on/off switch on L/AF engines is a hardwire disconnect of the smoke unit or not or if having it in the OFF position makes any difference while programming CV's, but thought I'd throw that out there. I don't use (or like) smoke. I have all my smoke unit switches turned off on all my Flyer DCC loco's. I haven't had any problems programming CV's either on the programming track or Program on Main. Mine are on when I program. In my case, the diodes would still "rectify" the AC enough to have the decoder working, but were not up to the draw from the motor. I don't know how common that scenario would be. Hi Guys.... I have been out of town so out of touch for a few days. Anyway I have tried all the above suggestions: setting momentum/braking to 0, tried PROG on programming track with PROG/RUN set both ways on the engine(S) also Smoke on/off, I noticed I had set the engine no. on the SD70 to long address and the non-responding ES44 to short address, so I set it to long also, I also set both locos on the test track and set up a 2 engine consist. To my surprise both engine responded very quickly and consistently, by that I mean the SD70 would change directional lights and cab lights would turn on and off and the engine would move as directed... The ES44 would change directional lights but set absolutely still, even the Cab light stayed on. I also tried Programming the ALCOs again with smoke off/on and Prog/run set both ways, no response whatsoever! In fact if power was interrupted on the test track they would respond to analog commands..... grrrr.. I guess the next step is to find a fellow DCC local that you can take your locomotive to and see if it works with their setup. Even if they don't have the same gauge you should be able to take a length of track to set up temporarily to try. DOUG-SR, Can you give more details - What is your power source? How do you control the smoke output? What decoder? The smoke is always on just like the old flyer,i use the dh465 digitrax 4 amp decoder and use a zephyer extra at present with out issue also did a flyer/lionel pa same type board the 326 has a s-n-s can motor. pa has led will add led to hudson soon . One thing to remember here is that the Lionel system is a multi-protocol system. It senses what type of current it "sees" when you start it up and then decides which mode to engage. Make sure you are only running one at a time! AC, DC, TMCC/Legacy, or DCC. Good suggestion, so I tried again with power to my layout turned off so no chance the Lionel locos could detect any modes other then those in the track(DCC).. I had the opportunity to attend the National NMRA Train Show in KC last Friday, I was able to Speak with Ryan at the Lionel booth and several people at the S Gauge booth! They all confirmed they had no trouble running their various Lionel/Flyer locos in DCC mode. I got the same list of possible remedies to my questions as all of you have generously suggested on this forum topic! None of them use(d) the Lenz DCC system... Most use NCE, so looks like it would be worthwhile to try testing on a NCE DCC system. 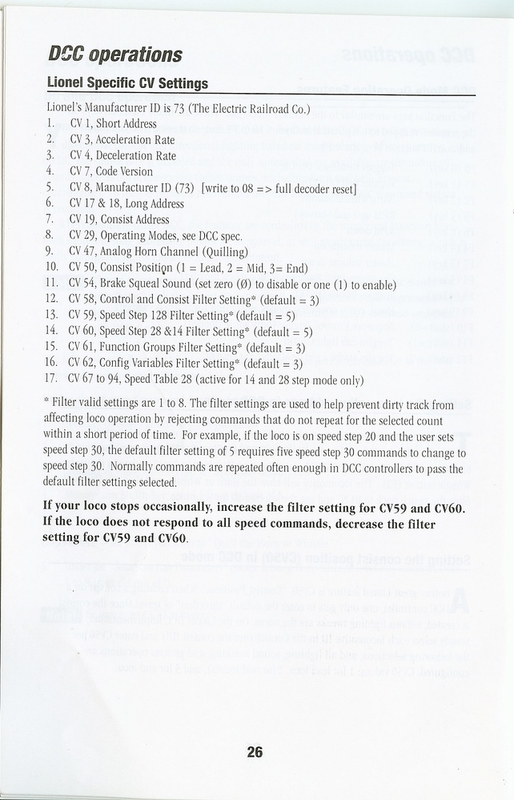 For locos that won't move, change the "filter" (CV59 or CV60) to 1. Easily set the DCC ID (2 or 4 digit) - simply select the ID on your DCC control, place the Prog/Run in PROG mode. Press the whistle/Horn button the DCC controller. Slide the Prog / run back to RUN. DCC ID will now be set. I developed the DCC for Lionel, based on a design I had worked on 14+ years ago I personally designed for my own use. The support is fairly complete, and some CV's don't make sense to implement with the loco features that are available under Legacy. But for certain the design covers the mandatory items per specifications. 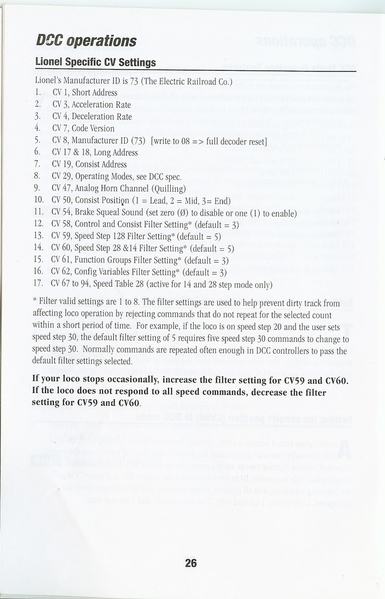 Additionally there are tune-able CVs, like CV59 to augment the basic requirements. Any ideas why one of my sd70s has about half the sound volume of the other sd70s and es44s? And some locos that I set cv54 to 0 still have the brake squeal. Is there a list of programmable cvs and what the factory values are? How do I reset to factory dcc? Regarding volume, have you checked the internal volume pot? An obvious question, but it has to be asked.